The benefits of CAD-CAM technology can be difficult to understand and even more challenging when attempting to integrate it into a shops manufacturing processes. Even as a pioneer in CAD-CAM software development, BobCAD-CAM agrees that shops seeking to gain an advantage through CNC software programming should evaluate all of their options. 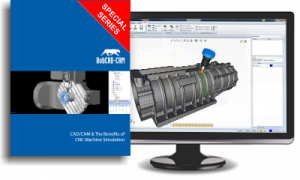 As a leader in providing CAD-CAM software we decided to provide the manufacturing industry with a series of CAD-CAM CNC Software whitepapers that will give shops valuable insight into the world of CNC programming technology, the value of CNC automation and an in-depth look into how CAD-CAM software technology is evolving. What are the advantages of CAD-CAM implementation? What types of machine toolpaths are available? Is more than one CAD-CAM product for my shop really necessary? Should I have to pay more for Service and Post Processors? What is the basic sequence of programming a job for my machine? These questions and many others really do need to be answered. And they are in this new series of CAD-CAM technology papers! Not only that, but they are free! If you are serious about your shops productivity, if you’re a student, an educator or even someone just curious about the endless benefits of today’s innovative and cutting edge CNC manufacturing software, then you will not want to miss out on the inside details of the technology that continues to aid in shaping the world around us. Click the image to download your free CAD-CAM technology whitepapers today!